It’s a job seeker's market right now, and anyone looking for a new position has hundreds of opportunities right at their fingertips – literally. All you need is a smart device and the right apps to take your search on the go, and apply to job openings anywhere, any time. You can find many apps that can help you find the best job for you fast and simple. However, with many apps out there choosing the right one can be confusing. We did our research and we have for you one great app for this purpose – HiJob Job Search. This app for both android and IOS users is a great and simple way for users to find the best job for them and develop their careers. This app offers the users to look for jobs in their local area and send applications for many openings. On this app, the users can find different jobs from health care, travel, retail, student jobs, to hotel and salon jobs. 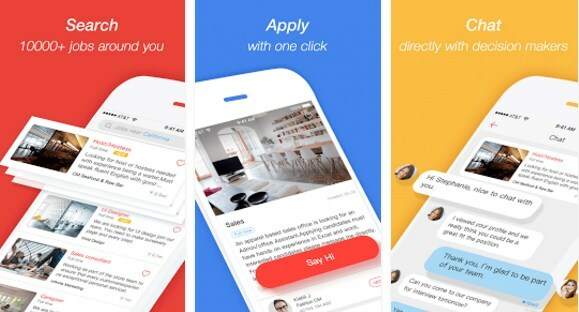 They can contact recruiters and employers through chats and send their applications fast with just one click, on the app. Fast and simple way for finding a job by preference without spending time looking through jobs that don’t appeal to you. This app has a smart search engine that helps the users to look through categories of jobs or look for jobs by locations. The users can find local job openings and use the interface for navigation through profiles and chats. The app offers constant notices and updates about new job openings and a live chat for connecting with recruiters for mobile interviews. The app allows sending applications only with one click and tracking those applications with the job management system. The app is highly protective and secure for all searches.